Billions in aid on the line: What will the U.S. do about Egypt? lots and lots of money to give away to people who run around like chimps never ever less–hey jew don't let me down take a sad song and make it better. URGENT THIS INFORMATION ITS NORMAL???????????????????. HIPOTALAMUS BRAIN AND FORNIX DESTRUCTION CASES VENEZUELA WITH NANOTEC. SECRET VENEZUELAN URANIO SOLD TO OTHER COUNTRY HUMAN RACE STUDIES IN VENEZUELA – DANILO ANDERSON VIDEOS TO HUMAN RETINS SOLD TO TRIBUNALS. SATELITAL SURVILLANCE IN VENEZUELA – NEURAL PATRONS – YOUR EXTRA THINKING SOLD TRIBUNALS – CICLICAL CICLYC TINKING FORCING YOU TO BELIVE IN FIXED FAKE IDEAS. PEOPLE SOLD TO HUMAN RACE STUDIES. AUTORIZATED BY THE HAGE AUTORIZATED BY SECRETARY BAN KI MOON. SATELITAL SURVILLANCE IN VENEZUELA – NEURAL PATRONS – YOUR EXTRA THINKING SOLD TRIBUNALS. http://www.mudpgi.blog.comHUMAN RACE STUDIES IN VENEZUELA. now I will go and NOT spy on people using NIGG A behavoir cause musliums are very very simalar fundamentaly. in a congressional "hearing" I mean telling I mean not telling I mean lying I mean not lying I mean calling it anything and everything until the media (not news" talks about something eles the NSA wants the media (not the news) to talk about "and just calm the American people down, that's all, just calm everybody down"...AND THEN GO ON ANOTHER TAXPAYER PAID VACTION TO LIE SOME MORE. Get yourself a dog teach it to chase its tail on command then when you leave your house you will have dog puke and dog sh it to throw at yourself...problem solved...or is it...I wonder what they master controler NSA will have their pupets say about it to "just calm the american people down, that's all just calm everyone down". Obama was not talking abt cutting Aid while the Brohood was in control! MCCain is speaking for Obama cuz Prez wants no ties. Come on DC we are not clueless. Until we see what comes out of this, hold off on financial assistance! They can afford nukes, they don't need as much support. Keep American money and troops out of it. Egypt's Foreign Minister Nabil Fahmy said on Sunday that he asked that all foreign aid be reviewed objectively and reasonably. Fahmy made his remarks during a televised press conference held amid severe international criticism and pressure over the current developments in Egypt. "I don't think the foreign aid is an interference in the domestic affairs," Fahmy said, adding Egypt appreciates the international help and cooperation. However, the top Egyptian diplomat said he has instructed the Foreign Ministry to review the aid provided to Egypt to determine "if it is useful or is provided as pressure." "We welcome the international efforts, but the national security is a matter of domestic affair," he said, reaffirming that Egypt is open for the international society, but rejects polarization for political interests. Meanwhile, ministry spokesman Badr Abdel-Aati called on all the media outlets to be neutral, balanced and professional when covering incidents in Egypt. Israeli policy on turmoil in Egypt discussed at two-hour Friday meet; NYT reports that Israel has been in 'heavy communication' with Egypt's el-Sissi, making reassurances that U.S. wouldn't cut off military aid. So Israel is the master contoller on the US milirary NSA & all US tax payer dollars. the imf sponsered bidding contest between russia saudi arab and germany/new york stock exchange over contol over a failed fly-over state... hmmm... a proverbial WWI reset. I belive that the muslium faith is in question as a religion if a truely inclusive gov. model is not pursued in the region formerly know as egypt. I do think that islamic law is not capable of producing anything except very very bad things that people in the region are always complaining about like dictators who tourture and kill citizens cousins. I think the army of islam muslim brother hood front in the region of egypt has many anti-social political objectives...ask yourself what real political party on earth today calls for religious centers to be used in acts of terror to make a political point in their own country for which they (muslium brotherhood) are called a majority. many many perception & mental problems here running free as backstabbing rat finks (with all due respect my friend, of course). Detroit should declare itself a "foreign "country and try to get foreign aid.The money the US sends to people who despises us is obscene.That money would be better spend rehabilitating our ailing infrastructure and cities.Just a thought.CHARITY BEGINS AT HOME!!!!! Good post, Erwin. Unfortunately, the right-wingers in Washington couldn't care less about Detroit. They want to use every bit of that money to bribe foreign leaders to take orders from them. These right-wingers need to get out of office! AWESOME! your statement made my day 🙂 Do you think I can go find an island somewhere and do the same thing...? If the U.S. had any sense at all, it would get the Germans to take over in Egypt and let them restore order for a change. Furthermore, let them use their money to bail Egypt out of it's economic logjam for a change, too. They could also carve out of Egypt a homeland for the Coptic Christians so that they would no longer fear persecution by the Muslim majority. Did German Chancellor Angie Merkel think of any of this? I think not! Israel builds tears down the village of Al-Araqib for the 54th time in a thousand days Thursday while also relocating residents to specially constructed towns @ a unimaginable cost to US tax payers. If the coup in Egypt is not a coup then what is it? Does this mean America still recognizes Mohammad Morsi as the President of Egypt or does America view Egypt's new rulers as the Military? If its not a coup, who gets the 1.3 billion dollars for this year and the jets and tanks promsied as well. Some legit humanitarian aid is all right and obviously needed, but if the arab spring and even syria alone taught us anything is the middle east isn't too keen on democracy and either way a lot of this treasure and weaponry ends up in the hands of brutal dictators or radical islamists. Giving them weapons is pretty ludicrous. Foreign aid and money is up for debate. At the very least we clearly need to be cutting that 1 billion down to the hundreds of millions or less since everyone knows we'll be paying it out anyways. If the US government drops $1.3 billion on the floor, they don't bother to bend over to pick it up. This small change is not going to matter to the generals who believe they are saving the country any more than it did to the Brotherhood who thought they were doing God's will. The whole world is getting sick of Americans whining about every dollar we dole out as if it were manna from heaven. The Marshall Plan is dead. The US today is one of the stingiest countries in the world with aid. If we stopped altogether, hardly anyone would notice. It doesn't matter that America is going to withhold the $, Saudi Arabia has already promised 10 times that amount once the brotherhood was removed from office. As for the other knuckleheads who think that militants from other countries are going to Egypt, well good luck with that, the military will go boom boom with them as well. This will be the burp that it is and nothing more, the military has a way forward and if the brotherhood or anyone else doesn't like it, well between the military and the police they seem to pretty effective dealing with trouble makers. I'm not saying its right, I'm reading the writing on the wall. Unfortunately Phelix, you're quite right. Egypt is deteriorating into another right-wing military dictatorship which will take our hard earned tax money even if it breaks our own economy since the right-wingers in Washington are so anxious to hand it over to them! I'm going to start my own country, open an embassy in Washington, let my wife overthrow our country, demonstrate in our back patio, then ask for huge amounts of foreign aid. Then the pool parties are really going to be great! they are muslims-what do you think the clown will do??? Ooops. I hit reply, but then noticed the word "clown," so you aren't worth a reply. The claim that there's billions of dollars awaiting to be handed over to Egypt is a crock. The money is placed in a New York bank, and the Egyptians then buy U.S.-made tanks, weapons, what have you. So all those billions are actually pumped right back into the US economy, and aren't going to help the Egyptian people. It does, however, help the Egyptian military remain the dominant force in Egyptian politics. Holding back allocation of those funds will actually bring unemployment to the US weapons industry. Bottom line–these billions aren't really helping the Egyptians out of their own economic mess. @storyteller,most certainly right and if we back out of Afghanistan then Egypt will be one of only a few countrys keeping the republicans and MIC happy won't it! !Remember also that Egypt is just a paid allie of Isreal at our request being bribed by our military aid for over 3 decades and to help keep the Suez canal open for us as well!! Good grief Storyteller, you must be an Obama loving Tea Partier. Do you realize that the money in question is being taken out of our economy before being put in the New York bank? In fact, if China and J apan were not financing a huge part of our current deficit, the right-wing politicians would be gutting both Medicare and Social Security plus closing down our schools and libraries, just for openers. Please Storyteller, quit apologizing for those right-wing idiots in Washington! it seems that certain people are perpetualy affected negativly by all of that disruptive fasting this time of year full moons mensration fridays proverbial shi t stiring ect. it would seem that the idolagies are in some way maybe many one in the same. I assume there may be a translation correction aribic to english but one can also assume any loss in content would be from english to aribic as english is the newer language thus more descriptive. the above quote reads in multiple ways: one way it reads is: civil society depends on the rule of law which is baised in the bill of rights – when there is a violation of a citizen personal liberty & rights it does lead/seems to lead to a breakdown in civil society, furthering a breakdown of justice and the rule of law which is among many things: undesirable. Egyptions need to figure out what it is they want for themselves in their territory...also what peace really looks like not just seek out the inverse in the false hope of unimaginable unthinkable perfection. yes.. a functioning.democracy is precisely about comprise from all sides. Support the terrorists as they always have. Quit taking my tax dollars and supporting the very terrorists that oppose our country. In the past years numerous historical sites all over the world have been destroyed. This is not random but targeted whitewashing. History is being re-written before us. Just like the templars did the exact same thing only in a more targeted area than 'the whole world' islam is destroying cultural sites all over the world. This happened in egypt too. In syria, in every single arab spring country. The reason this is particularly important , is just the same as I immediately saw that the people in syria were highly trained militants and not syrians, in egypt the same things are happening. You can do a profile , on all of this stuff and will likely come to the conclusion all the orders , all the decisions , all the tactics are from the same person/persons. We like to call our enemy AQ. But all AQ is , is a working class branch that got lucky and was effective more than the rest. It is clear they are all underlings to the same person, persons or group. Their tactics are obvious. Take advantage of any opportunistic outrage. Kill a bunch of people to get tensions up. Once enough people have lost friends and family they either submit or go on the rampage killing more people. Either outcome is a win for the enemy. Either outcome ends in them managing to take power. They are experts at keeping power too, they don't have the numbers or tech , or unity to fight us head on. But once you let them take power it cost more than it is really worth to remove them. This is why they pick the worst areas in the world to set up in. Where the communities there are near their breaking point where slaying 500-1000 people will cross the tipping point. Once people are angry enough it is so chaotic it is impossible to say who shot first or why they shot. To combat this strategy is actually pretty simple. First make it near impossible for their roaming army to cross borders. Second outlaw physical protest. All it does is invite chaos, it HANDS them power. Move protest online. Enforce curfew. This instills accountability. Masked outlaws != protesters. If you cannot do and say what you mean to and be identified and held accountable for it than you are no protester at all. You could then prove if those speaking are even natives of the country protesting. I assure you most of the 'action' is not being done by natives. Most of these governments claiming 'terrorist' are doing it are telling the truth. Then their reactions are scrutinized. How we are fighting this is best described as if during the cold war we totally ignored the russian government and targeted their special forces barracks. You have to identify and neutralize the command elements. The head of AQ answers to some one. Follow the chain. These protest are legit. They deserve their time. Just not in physical assemblies that turn to chaos that empowers the enemy. There needs to be accountability for who says and does what. Once you do this it will eliminate the ability of false flags, and reduce the carnage enough it should win by attrition. Muslim Brotherhood is strong-arm group who want Islamic Sharia Law thrust at the end of the blade down the Egyptian's throat. No wonder Military kicked them out. They don't represent the majority of Egyptians. The election was a coup itself. Election mask of democracy in Egypt was actually the hijacking for thugs to rule as legitimate govt. Which the population began to see and they plus the military wanted these actors thrown out. 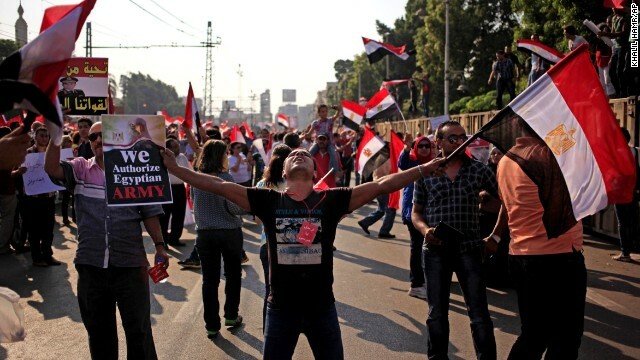 I applaud those with enough will to keep thugs out of the lives of Egypt political process. Maybe, Muslim Brotherhood will learn an important lesson. No ones going to roll over for them when they learn like Egypt what is at stake. As to be expected, the right-wing thugs in Washington will continue to send billions of dollars to Egypt, come what may! It's funny just how liberal these people can be when it comes to all these foreign aid giveaways!!! you're mean-spirited; all we do is trying to pull those Pakistanis and Middle Easterners out of the dark ages. You may remember Phunnie boy, that the Russians were trying to do the very same thing in Afghanistan some 30 years ago. Unfortunately, the right-wing news media lambasted them to no end and we had no way of knowing this. Remember Phunnie boy, that the Russians were motivated by their ideology whereas the NATO forces are motivated by the greed of big business in both the U.S. and Europe to exploit Afghanistan's natural resources for a huge profit!!! Phunnie boy, there is no such thing as exploiting natural resources. Natural resources belong to ALL; because some people lived there does not mean they own them. I am sure when natural resources or minerals are extracted, they are being used for something !!! Do you agree? Yes the local people should be compensated for their inconvenience.